On Xbox One, Ryse: Son of Rome will be available now until the end of April. 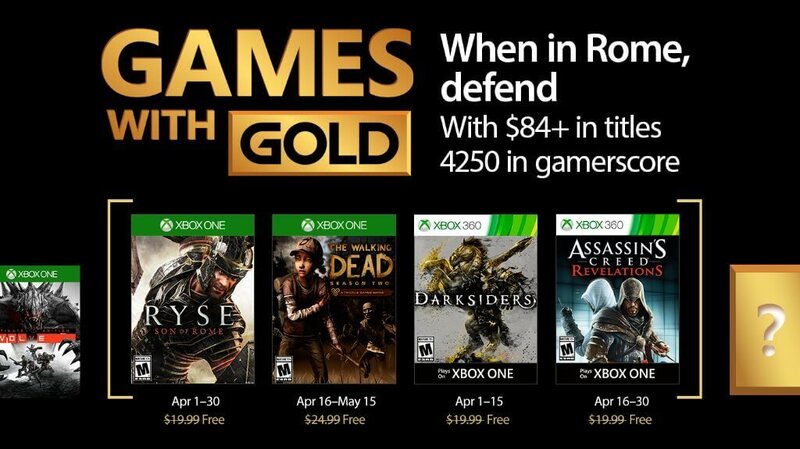 On Xbox 360, Darksiders will be available now until April 15th. The Horseman cometh. You are WAR! Caught in an epic struggle between Heaven and Hell, the legendary Horseman is left with only one option- to fight his way out. Wielding the fearsome sword Chaoseater, War must carve a bloody trail through Angels and Demons alike to uncover a dangerous truth…one that may bring about the end of mankind. EXPLORE the streets of a hell-ravaged city or ascend crumbling buildings to face horrors in the sky above. CONQUER Hell’s most terrifying monstrosities using a host of supernatural abilities and devastating combat moves. DESTROY your enemies by unleashing the unstoppable power of your Chaos Form! Darksiders. HEADS. WILL. ROLL. Last but not least, Evolve is still available until April 15th.